The item I did buy was parsley, for the parsley stems that flavored the poaching water. Using up fresh herbs is tough. I ended up having both cilantro and parsley on hand, which fortunately triggered the memory of a chimichurri sauce and one of my favorite and easiest Cooking Light recipes. chiles, undrained (such as Muir Glen), or whatever chunky tomato product you have on hand plus something to add heat. During the summer, I grew a jalapeño plant next to my tomatoes, so I did once attempt to duplicate this with fresh ingredients. The depth added with the fire-roasted version is nice though. Preheat the oven to 450°, preferably with pizza stone inside. If you are roasting a fresh pepper, cut in half lengthwise; discard seeds and membranes. Place pepper halves, skin sides up, on a foil-lined baking sheet; flatten with hand. Turn oven to broil and set timer for 10 minutes. Watch pepper closely until blackened (I say “watch closely” because in my house, broiling=smoke detecter goes off, even if I swear there’s no smoke or fire!). Place in a zip-top plastic bag; seal. Let stand 10 minutes. Peel and cut into 16 strips. Set aside. Combine ingredients for Black Bean Spread in blender or food processor and process until smooth. 1-2 ounces finely grated fresh Parmesan cheese, enough to cover Black Bean Spread in a thin layer. Return to oven and bake for 10 minutes or until cheese is bubbly. Combine chimichurri ingredients in a small bowl. 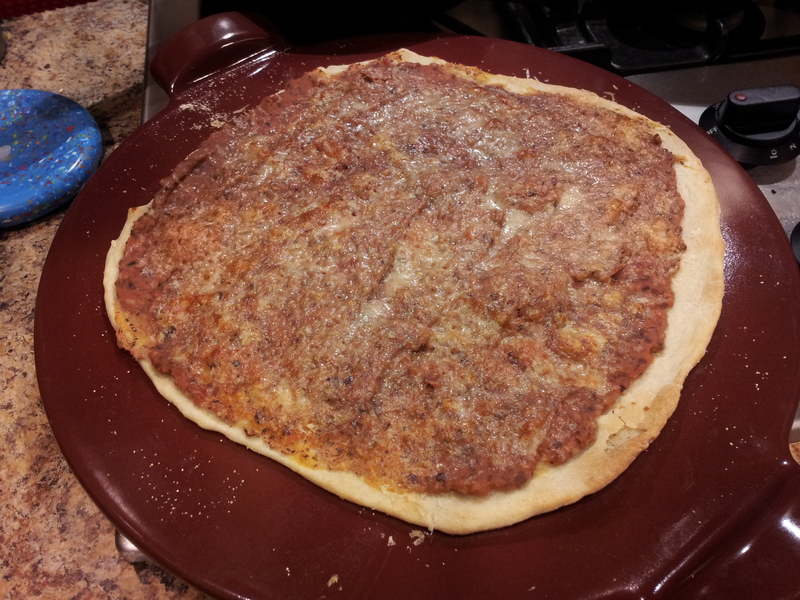 When pizza is done and cooled slightly, drizzle mixture over. Cut into pieces and garnish each slice with strips of red bell pepper. Then, with remaining herb leftovers, I took advice I found online for freezing cubes in olive oil. I also read some people using chicken broth or water. The oil combination makes sense to me though, since I have already been freezing batches of fresh basil pesto for years. This was just whole leaves. 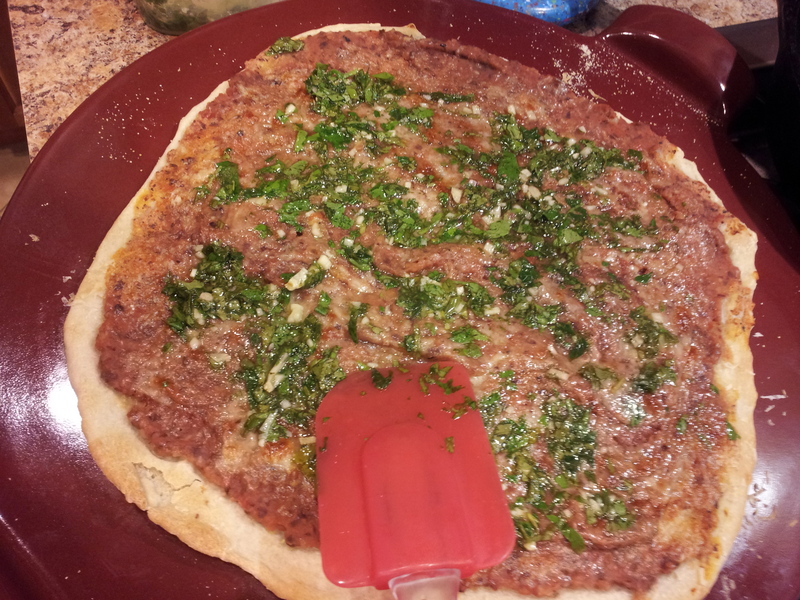 What also makes this great is that olive oil and herbs are the start for another chimichurrri! Any ideas for the leftover Black Bean Spread, besides eating it with tortilla chips? This entry was posted in Fresh Herbs, Recipes. Bookmark the permalink. Idea: Bring it to your mother.